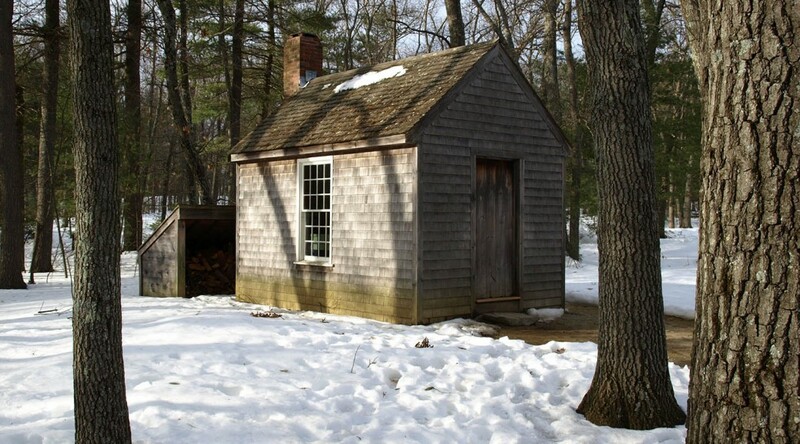 On July 4, 1845, Henry David Thoreau moved into a cabin he had built in the woods near Walden Pond. He was not seeking the life of a hermit, but wanted a quiet place to write, study nature, and experiment with simple living. Since his youth, Thoreau avidly explored nature and excelled academically. Upon his graduation from Harvard in 1837, he began meeting with Transcendentalist philosophers in Concord, Massachusetts, and became friends with Ralph Waldo Emerson. Thoreau’s first published work would appear in Emerson’s journal The Dial. 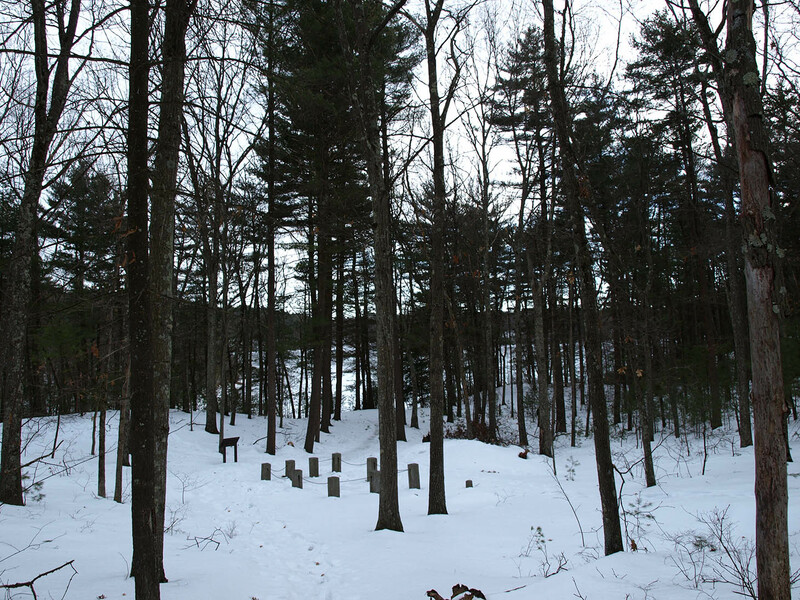 Thoreau soon got permission to use part of the Emerson family’s land to gain a deeper understanding of nature. He bought scrapwood and secondhand windows, cut pines with a borrowed ax, and built himself a cabin. He also planted two and a half acres with vegetables, mostly beans. His house was on a gently sloped hill, and its location is now outlined by stone markers. This was not an experiment in primitive living, but an experiment in simple living that Thoreau hoped could be applied more broadly in society. 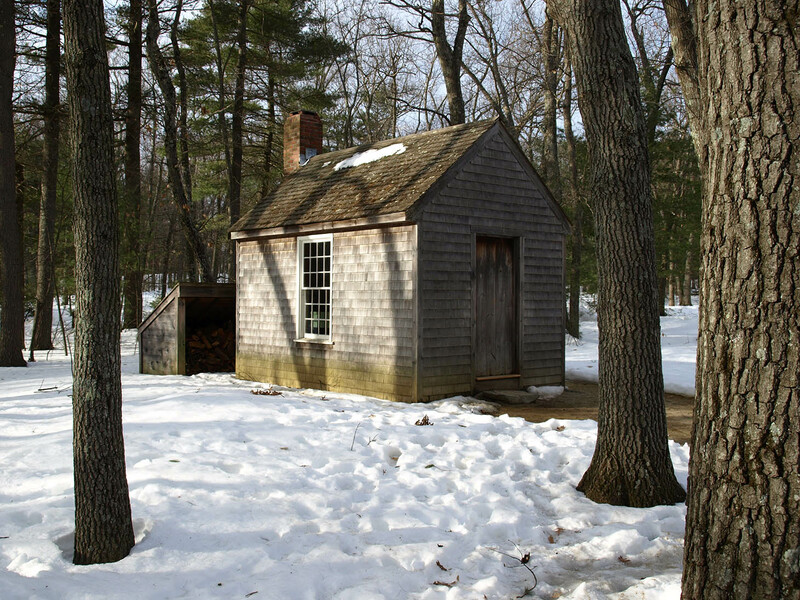 A replica of Thoreau’s cabin stands near the parking lot of Walden Pond State Reservation. Thoreau made the walls of his cabin from the outer layers of pine logs, so the surface would have been a bit rougher than the replica’s. In Walden; or, Life in the Woods, Thoreau noted that he lived about a mile and a half south of Concord, and a mile from any neighbor. 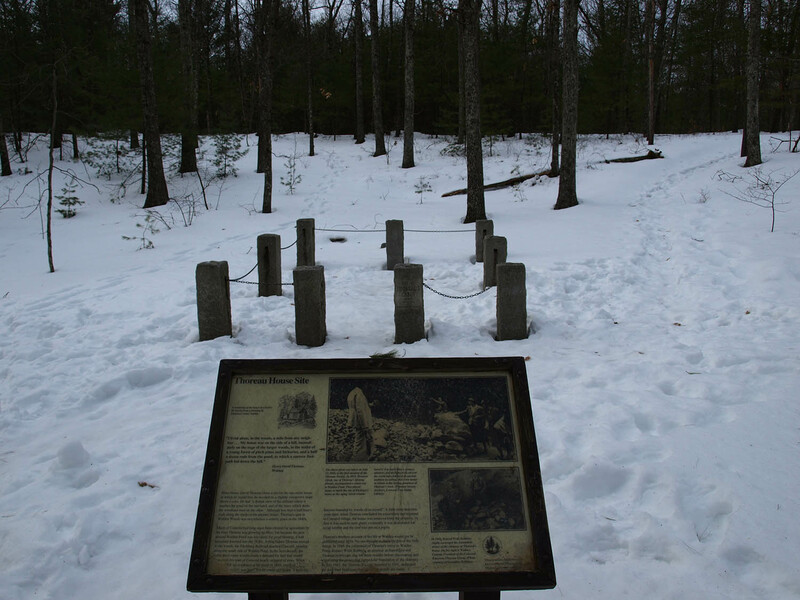 This was no mean distance for a proud saunterer like Thoreau, who said that “every day or two I strolled to the village.” Thoreau also had many visitors at his cabin, including fugitive slaves he helped guide north. 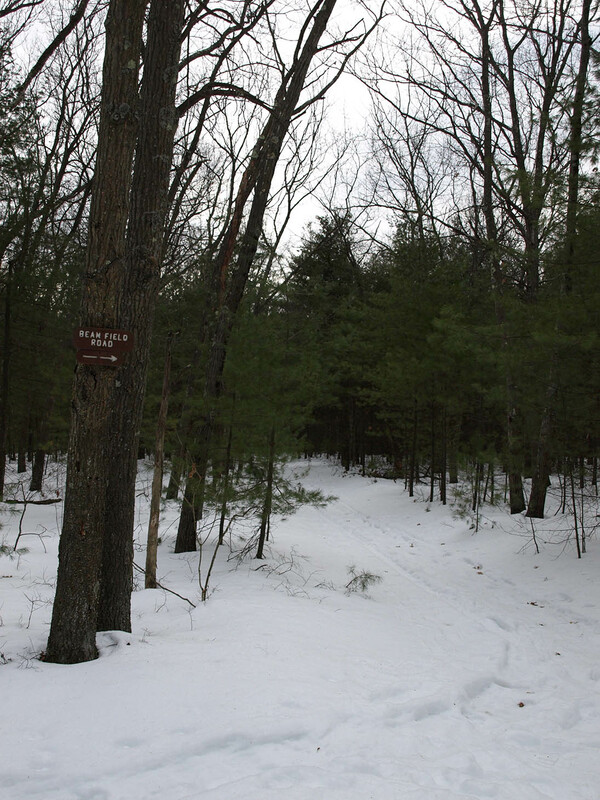 Not many people visited the cabin in the winter, but Thoreau still walked to town to socialize and conduct his business before walking back through the snow to his cabin. On lonely winter days he sometimes visited the grounds of ruined homesteads nearby and thought of their former inhabitants. Thoreau’s cabin stood not far from the pond. He described his winter morning work as taking an axe and pail to get water. Thoreau was living on the fringes of civilized life, where culture met the wild. He was close enough to participate in Concord life and visit his family there, but far enough away that many people considered his situation odd. This is exactly where he wanted to be. Thoreau hoped that the lessons he learned at Walden could be applied by other interested people. Discovering the essential facts of life would help determine how much time and work were really needed to obtain necessities and how much could be spent at leisure and study. It would also give Thoreau a deeper understanding of his relation with the rest of nature. Thoreau was a firm believer in the need for wildness as a tonic to restore and strengthen the civilized. The railroad was one product of modernity that clamored through the wild at Walden. Thoreau often walked by the tracks, and he seems unsure of whether to be awed or annoyed at the power of the train. Either way he could not ignore it, as the tracks that pass by the banks of the pond across from Thoreau’s Cove were operational in his day. Thoreau reflected on heat as a basic necessity of life, something common to all humanity. The need for wood to warm and to cook was universal. Food for fire was as valuable to Thoreau’s contemporaries as it was to their ancient ancestors. Thoreau did his best to explore and fathom the wild. He traveled around New England, observing and recording nature. His knack for measurement served him well in his work as a surveyor assessing property lines. 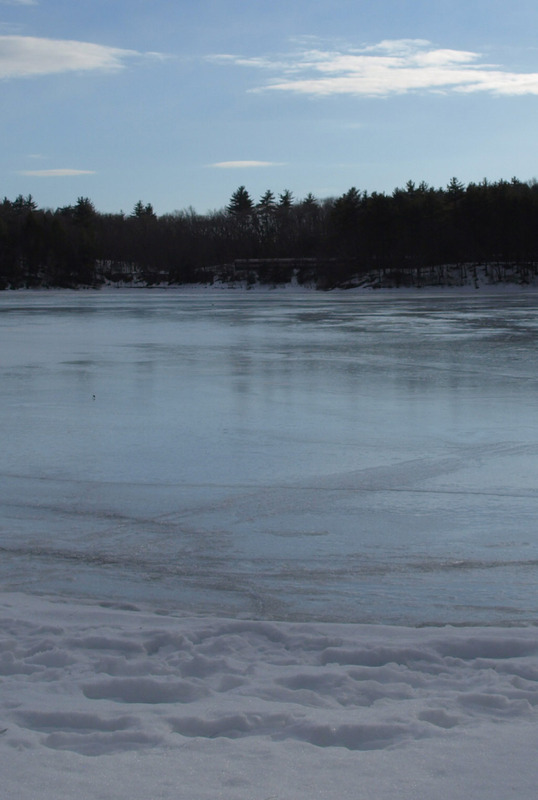 When Walden froze, Thoreau took the opportunity to measure the pond’s depth by cutting through the ice and dropping down a sounding line. He noted that “There have been many stories told about the bottom, or rather no bottom, of this pond, which certainly had no foundation for themselves.” The mystery of Walden was further compounded by the absence of streams feeding it, as it is a glacial lake filled by runoff. 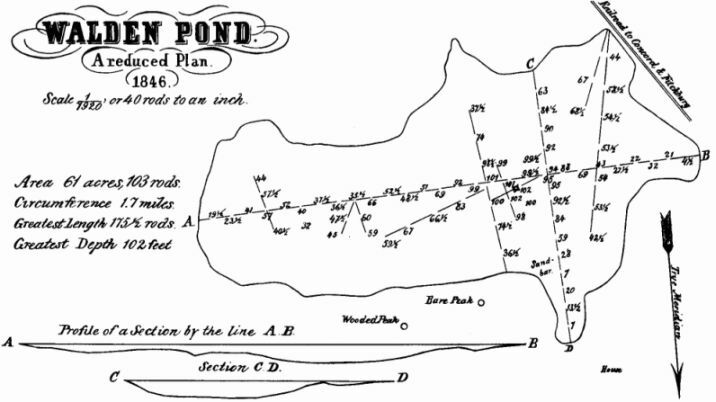 Thoreau’s 1846 survey of the pond is accurate to a close degree. 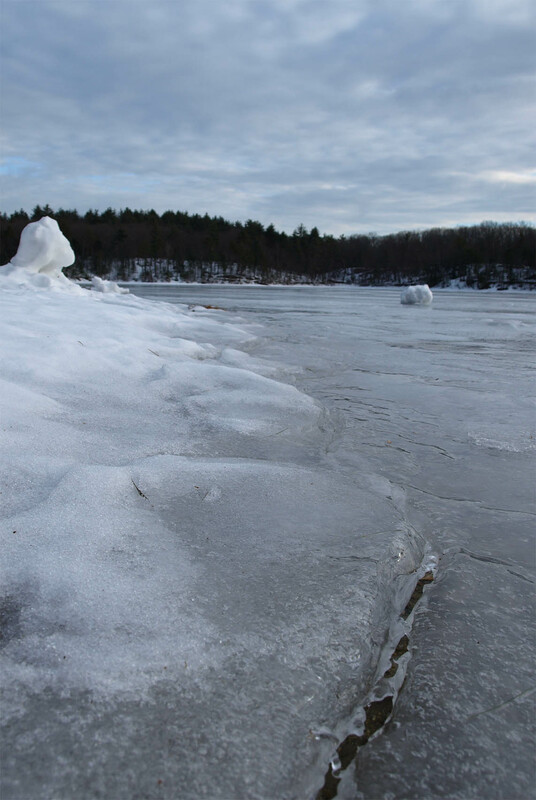 The ice also served Thoreau as a clear area to walk when Concord was covered in deep snow. Walden Pond became his yard. It was also a draw for icemen, who gathered the thick ice to keep food cool in the days before electric appliances. 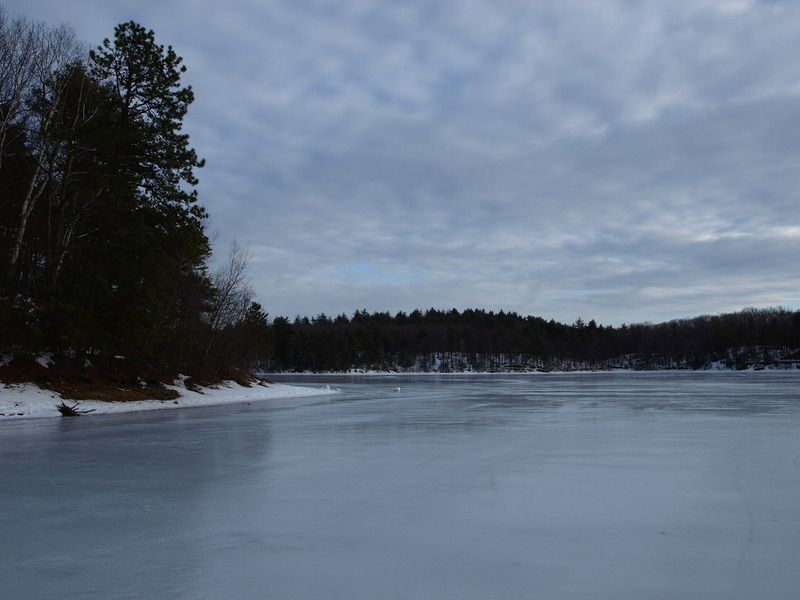 Today, walking on the ice is a welcome experience to those who rarely get to stand in the middle of a frozen lake. The ice varies in thickness, and cracks run through it. On September 6, 1847, Thoreau left his cabin at Walden and went back to living in Concord. He became “a sojourner in civilized life again” after two years and two months in the woods. Thoreau went on living his life and continued to deliver lectures on some of the day’s most pressing questions, including how to confront a government that upheld slavery and how to keep the right amount of wildness in a developing society. His time at Walden undoubtedly refreshed his writing. In 1849 he penned what would become one of the most influential American essays, “Civil Disobedience.” Originally entitled “Resistance to Civil Government,” the essay was largely inspired by Thoreau’s one-day imprisonment for refusing to pay a poll tax, which happened while he was walking to town from Walden. Thoreau also continued to study nature until his death from tuberculosis in 1862. 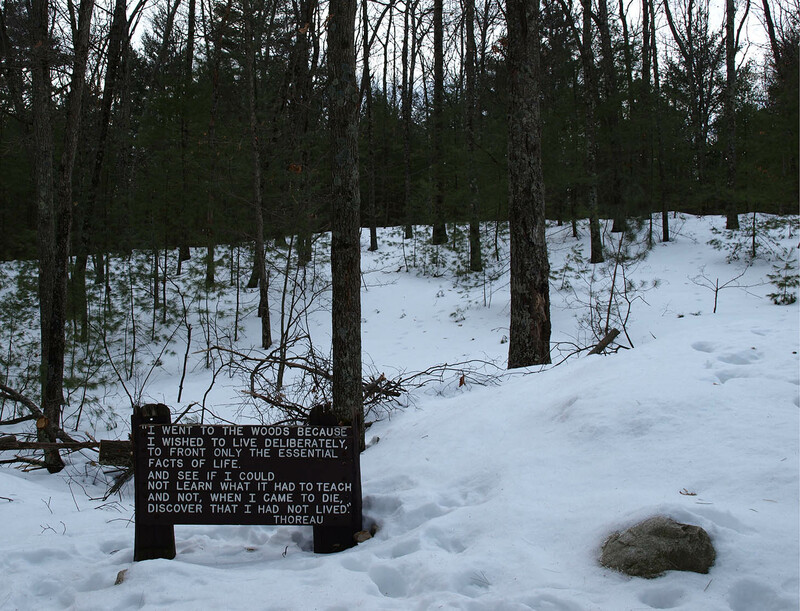 Walking around Walden, especially when the beach crowds are absent, gives us a chance to reflect on our connections with the rest of nature, and to consider the words Henry David Thoreau left us. Rise free from care before the dawn and seek adventures. Let the noon find thee by other lakes, and the night overtake thee every where at home. Thoreau, Henry David. Walden. New York: Barnes and Noble Books, 2003. Strolled to village, 154; Winter walks, 232, 240, 246; Gathering water, 256; Tonic of Wildness, 285; Wood, 227; Unfathomable, 286; Measuring pond, 259; Sojourner quote, 7; I left the woods, 291; Seek adventures, 188. Baym, Nina. “Thoreau’s View of Science.” Thoreau Reader, EServer web publishing project, Iowa State University, 2009. Goodman, Russell, “Transcendentalism”, The Stanford Encyclopedia of Philosophy (Spring 2011 Edition), Edward N. Zalta (ed. ), http://plato.stanford.edu/archives/spr2011/entries/transcendentalism/. Hoag, Ronald Wesley. “Walden, The Place.” Thoreau Reader. “Replica of Thoreau’s cabin at the Walden parking lot.” Thoreau Reader. Schneider, Richard J. “Thoreau’s Life.” The Thoreau Society, 2006. 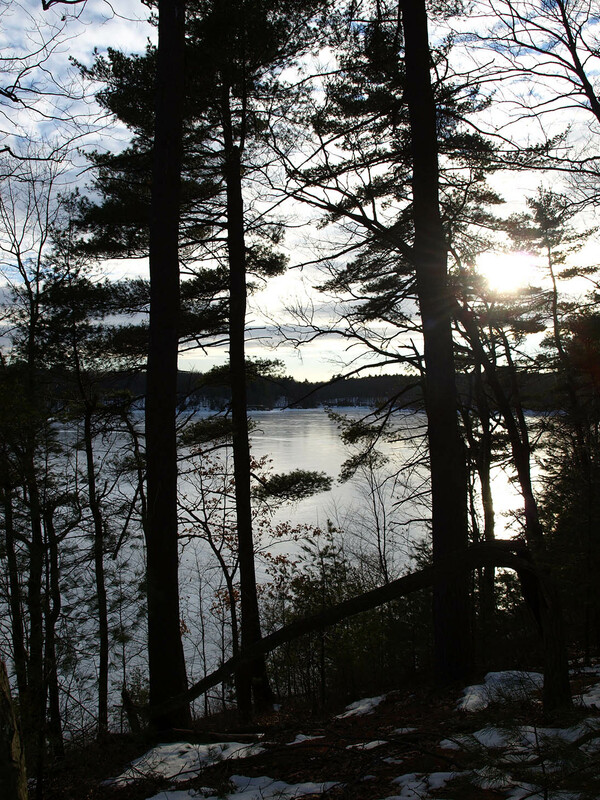 “Thoreau’s 1846 survey of Walden Pond.” The Thoreau Reader. Thoreau, Henry David. “Civil Disobedience,” Ed. Richard Lenat. Thoreau Reader. It is refreshing to find the example that Thoreau set long ago has found a breakthrough way to make an impression upon our too often technocratic society. How often does highlighting the experience of wildness resonate with technology? Hardly at all, and not often enough, to sustain the sanity of our human existence. Thank you. Thank you. Modern technology sometimes makes it easier to experience nature, at least in locating and traveling to different locations, but a conscious effort is needed to balance modern and primitive, as Thoreau counseled.